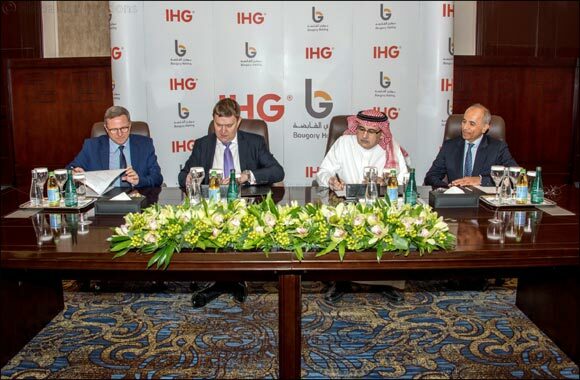 24 January 2019: IHG® (InterContinental Hotels Group), one of the world’s leading hotel companies, has signed a management agreement with Bougary Holding Co. to develop Crowne Plaza® Makkah Beban. Scheduled to open in December 2019, the new hotel comprising 1200 rooms will be world’s largest Crowne Plaza® and will be a landmark hotel for IHG. Strategically located in close proximity to the Holy Mosque, the hotel will join the existing InterContinental® and Holiday Inn® in the city and cater to the influx of pilgrim visits expected as part of Vision 2030. IHG is the largest international hotel group in Saudi Arabia, both by number of hotels and number of rooms, and the latest signing is aligned with the company’s strategy to expand its footprint in the kingdom. Originally from Makkah, the Bougary family has been in business for over 200 years. Based in Jeddah, Bougary Holding Co. develops, manages and maintains properties including residential, commercial, clinical and marketing complexes; buying and procuring lands and properties for development and construction of buildings and centres. While the group’s business is predominantly real estate, it has recently focused on hospitality in Makkah and Madinah markets.